Kahuku Farms is a true island treasure. Kylie Matsuda is a 4th general farmer. She and her husband, Judah Lum, welcomed us to their lovely farm and home. The Farm consists of 125 acres spread across the valley and the wonderful north shore coastline. The Farm’s primary crops sent to market are papayas, long eggplant, luau leaves, and bananas. Of the dozen families that formed a farming coop when the plantation shut down, there are 3 families still in business. The Matsudas and Fukuyamas that formed the Kahuku Farmers Inc. and Matsuda-Fukuyama Farms Inc., and the Nozawas who grow sweet corn. Diversification was Kylie’s vision as farming is a costly and very risky business. 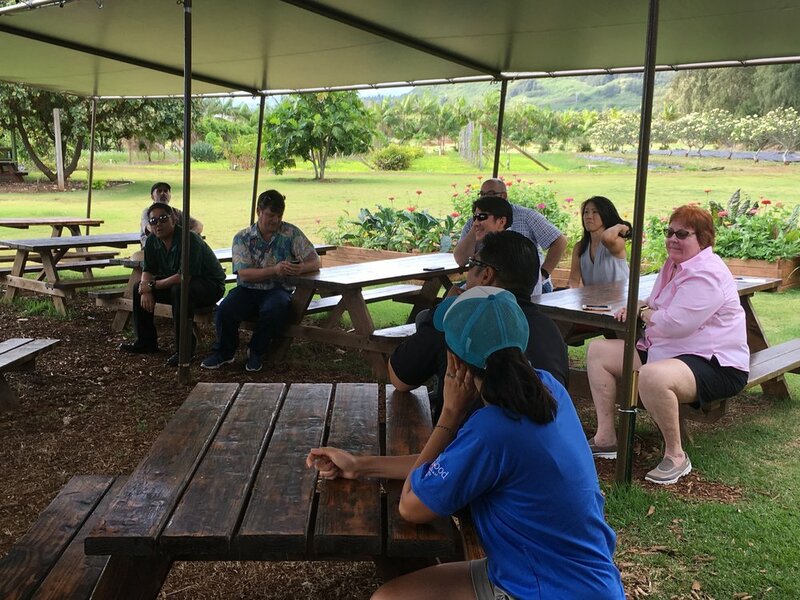 Agri-tourism is a great way to draw interest about island agriculture and a way to educate visitors on the importance of caring for the land while offering tasty treats produced yards to a few acres away. Kylie said she especially enjoys educating kids about where our produce comes from. Both the Cafe and the Farm were opened to the public in October 2010. The Cafe serves meals and refreshments grown on the Farm. The Farm grows its own acai, cacao, kale, lettuce, lilikoi, sugar cane, green onions, mint and basil. Did you know that about 90% of our food is imported? Although we have farms spread across the islands, on a grand scale, we produce a very small amount of our own food. Controlling the bug population and the weeds is a constant issue. Weeds love our year-round awesome weather just like the bugs love our crops. Disease is another matter of concern. On another note, making sure there is enough water is another concerning topic year round. Farming is truly a huge undertaking. At the start of the tour, we saw what Judah called static hydroponics, which is the most basic form and can be used for quick production. It needs no electricity and costs very little. The pictures show lettuce growing out of the tub of water. The container is filled with water infused with the plant nutrients and covered with a piece of styrofoam to fit the container. Holes are cut into the styrofoam to hold the lettuce heads. Behind the Café are raised beds with plants growing organically amid the backdrop of the grassy lawn and field. Kylie mentioned that the Farm is working toward its organic certification for the 5 acres behind the Café. Not surprisingly, it takes a few years to earn the designation. On the commercial side, best farming practices are used, but now they are adopting some of the farming systems used from the Farm’s organic fields. We walked to a section to the side, where pallets held the waste products from the Cafe. We saw how the waste goes through stages of breakdown and its own production of microorganisms that will be used to nourish the plants. The fields are massive. We saw just a small portion of the farm with fields of old and new papaya trees, taro plants, cacao trees, and banana trees. Lining the roadways were acai palms and other trees and bushes. On the tour, we passed lilikoi vines and other trees. We also rode by the packing plant where the produce is cared for and made ready for pickup. 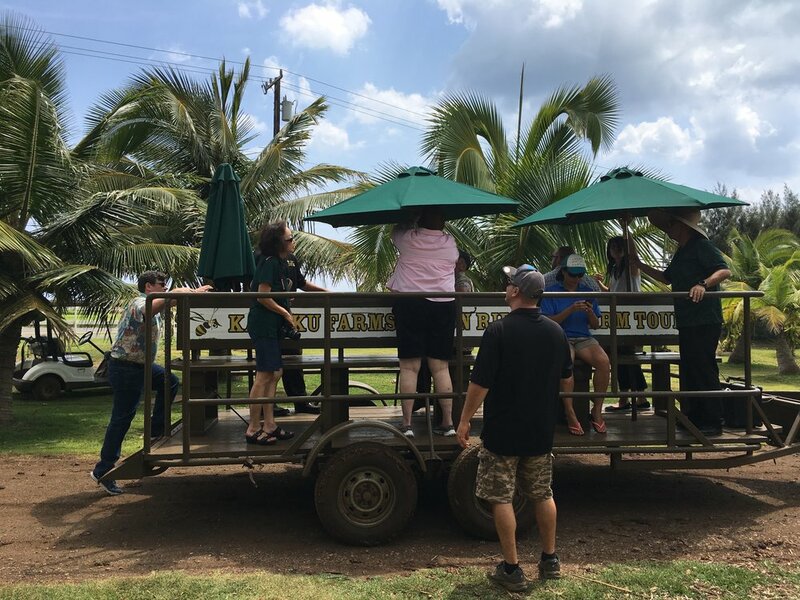 In talking to Kylie, Kahuku Farms has 15 employees specifically for the fields, café and tours, and 20 who work the commercial farm. Quite a small amount of people for what seems like a large operation---125 acres! The tour ended, and we disbursed to the Café. It was a wonderful place to contemplate the enlightening experiences of the morning.